Who said you have to have a valentine to celebrate Valentine’s Day? Moreover, who deemed that Valentine’s Day was only for couples? Getting sad because you don’t have a boyfriend or girlfriend to shower you with chocolates in heart-shaped boxes and rose petals all over your bedroom on Valentine’s day is a total waste of energy. Valentine’s Day is a day to celebrate love! And love isn’t exclusive to romantic relationships — love is for EVERYONE and EVERYTHING. Sisters, cousins, parents. Best friends, cats, your goldfish. Pudding, tequila, massive amounts of carbs. YOURSELF! I don’t mean to imply that you’re a narcissist because you love yourself. I just mean that YOU are an incredible human being and YOU deserve, in the words Tom Haverford, to TREAT YO SELF. So, how about treating yourself to an obscenely romantic Valentine’s Day dinner? Oysters and champagne and Godiva chocolates are all decadent and euphoric-inducing choices. But let’s get outside of the box, shall we? Start off with this kale salad — you can’t go wrong with pecorino, garlic, breadcrumbs, and an insanely healthy dinosaur-era-looking leafy green. Joy’s edamame toasts would be a good little appetizer, too. Sass up a timeless classic and splurge to make lobster grilled cheese. That’s right. Lobster. Grilled. Cheese. If you’re not a lobster fan, try your hand at this gnocchi mac & cheese. A new spin on the ultimate comfort food. These roasted garlic mushrooms would make a killer side dish. As would these lemon garlic brussels sprouts. Pink donuts with toasted coconut? How much more Valentinesy can you get? And you can’t go wrong with this cherries + chocolate + shortbread combination. I fully support making a lovely dinner and watching (500) Days of Summer for the billionth time accompanied by the ever-faithful combination of Dove Dark Chocolates and a goblet of cabernet. Even if it means you will be participating in these activities solo. Own it. It’s Valentine’s Day. Spread the love. Treat yo self. 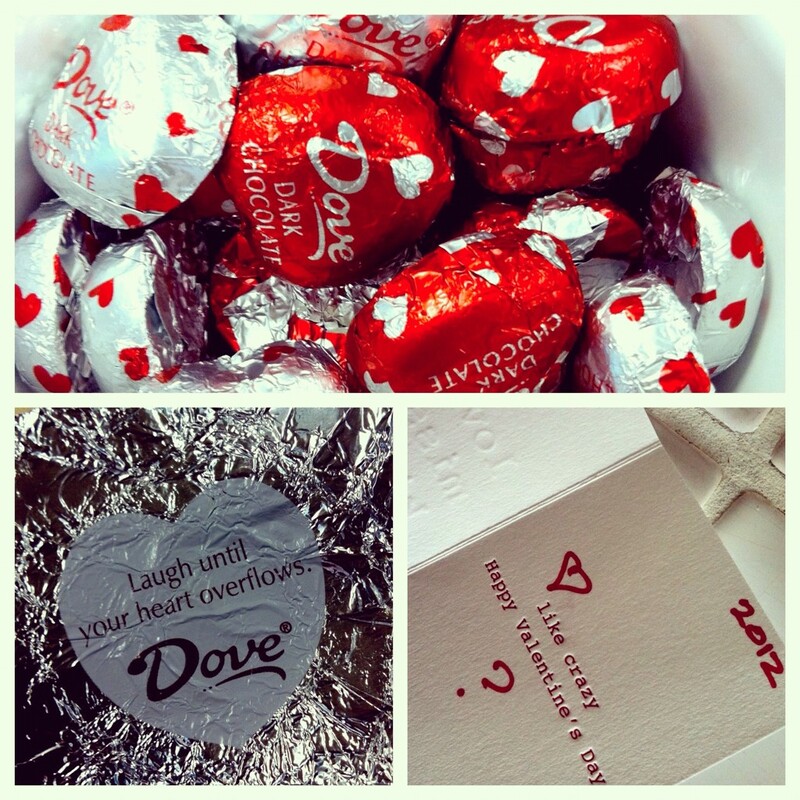 Those dove chocolate wrappers make my water! It is an instant response to amazing chocolate. Thanks for the link to the lobster grilled cheese. We will have to try those. Thanks again. Enjoy your day! Kels, I followed your advice and made Tracy’s kale salad last night. Absolutely delicious! Though quite frankly I’m not sure I would have wanted my valentine to smell my breath afterward! Hahaha Loving this post! Keep ’em coming!